Read all about it here at Food Production Daily. How is it that they can call this stuff “food” and sell it and yet raw milk is illegal? Will people really eat this stuff? It’s amazing how far we’ve come when they claim the next big breakthrough is edible packaging when nature has been providing this to use safely all along. What do you think? Would you prefer an apple or this? 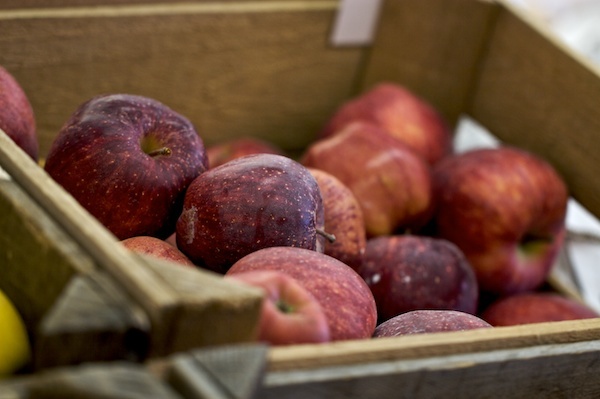 5 Responses to Why Wouldn’t You Just Eat a REAL Apple? See, now I didn’t interpret that article as them working on a technology to REPLACE the apple. I read that as they’re working on something to replace things like plastic bowls, bags, cans, and bottles with something that “works like an apple or an orange.” In other words, something like “canned soup” might come in an edible or compostable bowl. Or you might have “soup bites” or “yogurt drops” that get popped into your mouth like donuts. Something comparable that we’re familiar with might be liquid caramel wrapped in chocolate or a candy shell. Now THAT idea is a bit intriguing. I like the idea that they’re taking queues from nature when making commercial products. Granted, it’s probably still a highly-processed end result–which you can disagree with for a whole host of other reasons, but I’d argue that if people are going to buy packaged products anyway, we might as well have more environmentally sound packaging for them. I guess if you’re eating processed food, having an edible package wouldn’t bother you. To me, it seems like a problem we shouldn’t have in the first place. Seems like the problems in our society usually stem from laziness. I agree that packaging is a big concern, however I do not think edible packaging is going to work as well as they might like. It would most likely be put inside another packing material for shipping and handling and your right back at square one. Also we humans have such a narrow focus when it comes to processed “food” of any shape. The fact is we can not replicate the complexity of nature, we are still learning just how complex natural/real food really is! We do have the ability to put in place a system of packaging that is either compostable, or 100% recyclable that would be a wonderful step in the right direction.